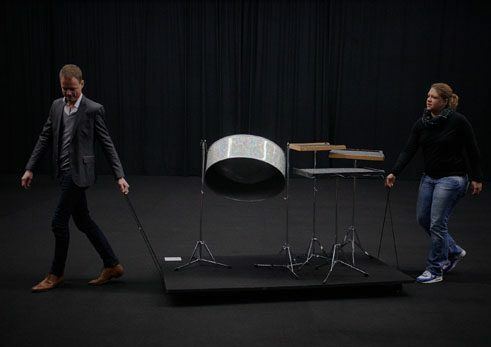 In January 2017, Xavier Le Roy, Tiziano Manca and Christophe Wavelet showed an unusual exhibition at Frankfurt: The artists arranged the musicians of the famous Ensemble Modern, but also their staff, their instruments and working equipment to an accessible exhibition that was always changing. An Interview with Xavier Le Roy about “Haben Sie ‘modern’ gesagt?”, a very special portrait. Xavier Le Roy, “Haben Sie ‘modern’ gesagt?“ is a portrait of the Ensemble Modern, but in the format of an exhibition. Why? I would not say it is a portrait but rather an exhibition of the Ensemble Modern. To start we were looking for a way to question the usual format to experience the kind of music the Ensemble Modern is doing. Furthermore, the exhibition is a form that I am experimenting with lately. I am interested in the potentials of exhibition as a way in which art is made public, which is different from the form of the theatre, the concert or a movie in the cinema. The invitation that is made to the public is contained by different conventions, it makes different proposals in terms of time and therefore creates other kinds of relationship between the public and the art. In the theatre, each spectator is assigned to a place and a group is required, it is an experience that brings people together, but in the exhibition, you rather move by yourself. You can choose when you go, where you go, in which space you go first. In the cinema or in the theatre, the duration is something that is decided for you. 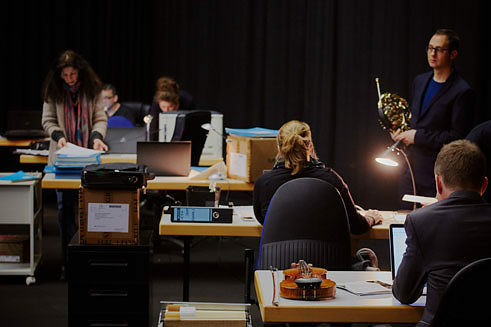 You did not only show the musicians and their instruments, but also office desks, administrators and technicians. Why? In the beginning of the process, we did interviews with all of the musicians, and out of these interviews we realized that in order to work on this form, we had to include as much of the elements that are participating in the production of this music as possible. So not only the musicians, the instruments, the scores etcetera, but also all the production and administration team that is actually part of the way this music is produced. 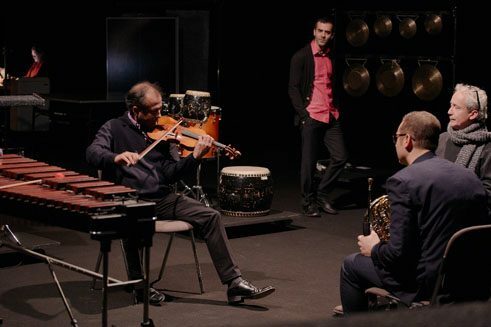 The conversations with the musicians about their practice were always linked to how the whole Ensemble and the whole organization is working, so it was very important to us to try to articulate this in the work. The exhibition was like a series of different scenes, a slow building of pictures and dissolving again, objects as well as people moved all of the time. How did you develop these small scenes? The three of us, Tiziano Manca, Christophe Wavelet and I, worked by debating and discussing all the questions that we have accumulated before and after these interviews. Many of these questions have been translated in artistic operations that would allow to experiment with the members of the Ensemble Modern. The different parts or scenes put at work these operations, and as a continuity between all we use the idea of the exhibition as something at work. 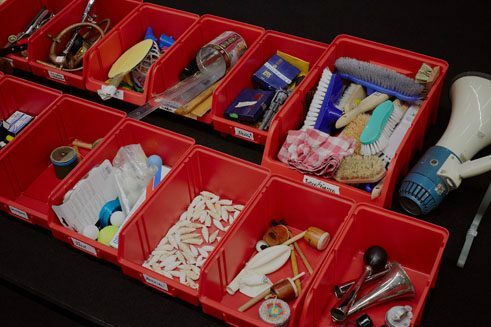 Rather than rehearsing in order to aim for the best way to perform this or that music, we proposed to the musicians to play some things that are at work. It was not possible to rehearse very long with the Ensemble because of the expensive costs, that was one of the constraints. But we took this as something to use. We didn’t want to reproduce the way musicians are usually working, like getting a score, work on it individually and then meet with the others to rehearse and perform the best they can. 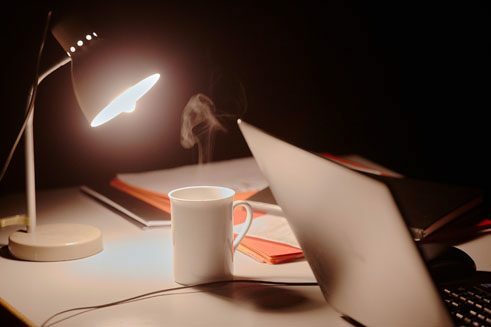 For example, for one of the operation we call recordings, we used and display the actions at stake during the recording: working on a part, repeating and listening, have a comment, replay a part etc. These things could be rehearsed during a very reduced time, as it was mostly a matter of discussing and sharing with the musicians our proposal of sequence that didn’t need to find a resolution before the performance with the public. We also had the desire to work mostly with individuals one by one in order to follow the structure of the Ensemble Modern which presents itself as an Ensemble of Soloists’ and as a way to use the constraint of the reduced amount of rehearsals. That transformed their usual mode of rehearsal and required a lot of preparation work for the three of us before starting the rehearsals with them. Contemporary music is still quite elitist, I think, is has a specific, very well-informed audience. Your approach also changed its context. From my perspective, the operations that we proposed were allowing an approach to this music that doesn’t require the public to have a specific knowledge about it. The public wasn’t necessarily expected to be a part of “this elitist world” as you say. There were many moments when for instance the musicians could discuss with the public, the visitors could get close to them, when they were working on a score of their choice for example, so that the activity of working on a score and rehearsing would produce an access for the public to listen to the same part of a musical score several times in a row. This allows learning, differentiating and discussing how to listen and what we hear. The exhibition format allows also to literally bring the public closer to the musicians, the score, the instruments. Where did the title came from? What does the term ‘modern’ mean to you? The title came obviously from the name of the Ensemble Modern, and is standing for the desire to put in question the understanding of modern. Modern for this Ensemble, but also in our culture: It is an invitation to rethink what we consider to be modern in our time. Esther Boldt conducted the interview. She is a freelance dance and theatre critic for several publications, including “nachtkritik.de”, “taz” and “tanz Zeitschrift”. Copyright: Goethe-Institut, Esther Boldt/a>. This work is licensed under a Creative Commons Germany Attribution – NoDerivs 3.0 Germany license.